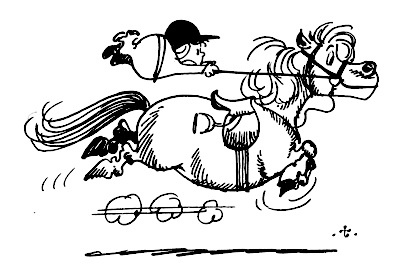 Not a totally accurate representation, but the lovely Norman Thelwell could have been looking at the little mare’s face when he drew this one– especially if he had added ears pricked absolutely straight forward at the jump, total focus on what is turning out to be a fun new job. Luckily for me, I stayed in the saddle the entire time, though there was one jump where the little mare asked the question “so, how far over this thing should I go? This far?” that had us leaping about four feet over the 3 inch cross-poles we’d set up. Well, then, nothing happened. She literally popped over it and cantered away as if she’d been doing it all her life. It was faintly adorable (I will admit to giggling like a lunatic–she was just so cute!). We did a few more (teeny-tiny) cross-poles, including one brightly coloured set that caused her to try out the old “launch myself over just in case this is what is wanted” trick. She didn’t even really launch, to her credit, just sort of stood straight up and then hopped over it with her back legs. I was not at all helpful as it set me off giggling again, but at least we were both relaxed! We ended on such a lovely forward note, a nice change from how we began! She got a couple of days in the field over the weekend to have a think about her fun new hobby, and then we did a tiny mini-course yesterday. She was still lovely, and a bit softer in the beginning, though still wishing to occasionally demonstrate her llama-imitating abilities. The second she saw we were going to jump again, her whole demeanour changed, and her ears shot forward (she is one of those nosy horses who *have* to know what is going on at all times–so her ears are normally wiggling about quite a bit). This, of course, made me start giggling again, especially when she successfully negotiated her first “combination”–a three stride line consisting of a pole to a cross-pole set not much higher than the pole. She popped over the pole, cantered, stuck her ears straight forward at the cross-pole and just jumped right over. I almost forgot what I was doing and clapped, just out of sheer pleasure at how lovely it all felt. After that we played around, making wide loops to fences and even some broken lines from fence to fence. She never looked at a thing, even when it started to get dark and the shadows sprung out from under the fences. She is a confident little thing; one of those babies that just feels like, whatever you point her at, she is going to give it a go–so you need to make sure you’re serious about what you’re aiming for! I cannot wait to get this mare out somewhere where she can really open up and give XC a go. 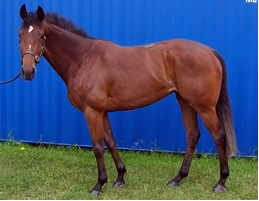 The canter itself is a dream, already super rhythmic, and she appears to be quite brave–I cannot wait. The current plan is to spend the month on this “fun” stuff and, at most, one day a week in real flatwork. Everything else will be hacks (a few times a week) and at least one day a week cantering over the tiny stuff. Fingers crossed we are doing a tiny course in a month or so and then….party time! (One of the things I love about the UK, is the tendency to call any outing with the horses a “party”.) So, her first party will probably be in March, maybe a tiny jumper show or an outing to the local smaller than logs XC course to try that out as well. And at some time I will take some pictures! Woop! That said, I might as well give everyone something to compare the newer pictures with. This is the sale picture that made me just grab a horsebox and go get her–such a lovely girl–and I freely admit to having being extremely swayed by that tail (and that face!) Woop (again)!